The Greyline® is the perfect gathering place for groups of 40-200. 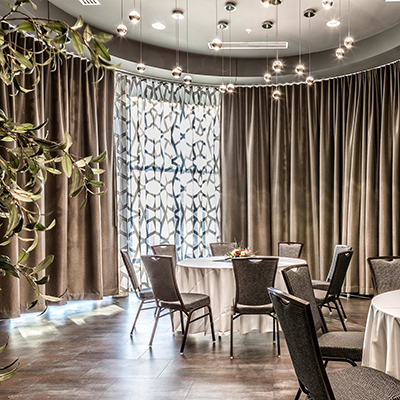 The dining room accommodates up to 150 people for seated receptions. We are able to accommodate up to 200 guests for strolling events. The Greyline has the ability to be set up in multiple configurations depending on the needs of your event. The layout of the space allows for areas to host smaller groups and still feel like an intimate setting. 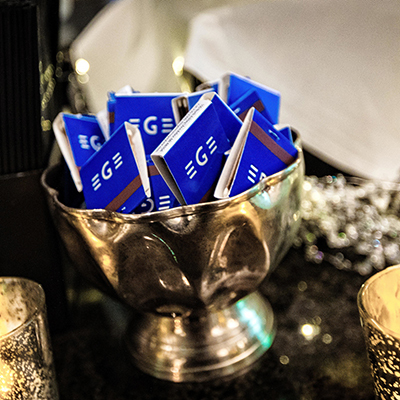 Whatever your event, the Greyline can be anything from raucous to refined. 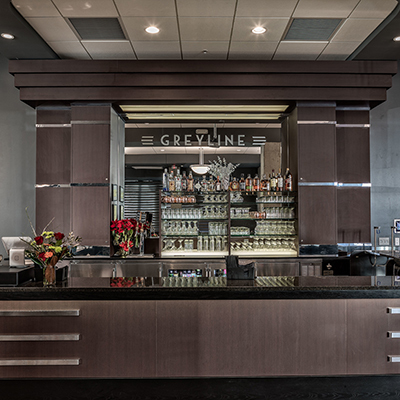 The Greyline is ideal for both corporate and social events. 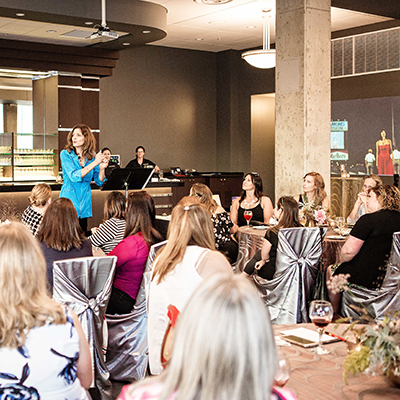 We are able to host corporate meetings and training sessions, panel discussions, casual or upscale wedding celebrations, birthday parties (for kids and adults), rehearsal dinners, bar mitzvahs and bat mitzvahs, tailgate parties & more. For corporate events, our in house audio system provides the ability to have multiple microphones, we have a built in projector for simple presentations and we work closely with a local company to provide flat screens for more detailed or interactive presentations. We keep basic presentation essentials on hand for you to use for corporate events, large post its, markers, extension cords, and plenty of outlets for your guests to keep their electronics at full charge. Our in house wifi allows for accessibility during your event. The beautifully appointed space provides many wonderful opportunities for photography during social events and weddings. There is an area for a dance floor, gift table, and registration. There is infrastructure in place to allow DJ’s and bands easy set-up with plenty of electrical capacity. A welcome message including your event name and logo will be projected for your guests to see as they enter the space. If you’d like a more specialized or custom welcome message projected, we can give you pricing on having something designed by our in house artists. They can also create a hand painted poster for you to take with you to commemorate the event. Background music can be chosen from our provider, or you may choose to create your own play list. We provide two microphones for your use, a lavalier and a stick microphone. There is an option to add additional microphones (up to 8) for panel discussions or other uses. We have installed electrical capacity with a separate designated sub panel that is available for DJ’s, bands, or other vendors to utilize during your event for convenience and assurance of capacity. There is a designated charging station near the bar that includes a variety of different power cord styles for you and your guests to revive their portable electronic devices. Make the space truly unique for your event with floral arrangements and customized decorations and lighting. We have several experienced designers that we work with and recommend. The space has the infrastructure that allows designers and florists to more easily create the perfect backdrop for your event. 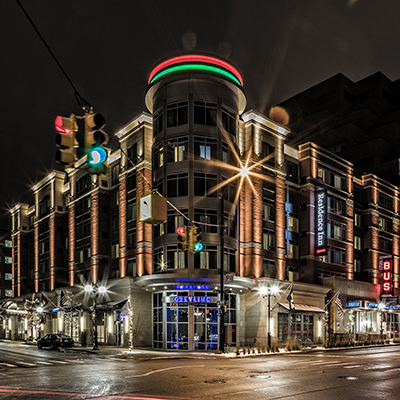 Rooms for your guests can be booked on site at the Marriott Residence Inn, Downtown Ann Arbor. All of the basic needs for an event, such as tables and chairs, glassware, china, flatware, and basic linens are included. Any special requests that you’d like to add as special touches to your event (such as colored tablecloths, specialty glassware or china, decorations, etc.) will be identified when you are planning your event and will be included as an additional rental charge on your proposal. The rental cost of the Greyline varies based on day of the week. The base rental rate includes the use of our of tables, chairs, house linens, china, dishware, and glassware. Additional costs depend on your service style and chosen menu. Most events range from about $50–$150 per person all inclusive, depending on guest count, service style, bar options and menu selection. 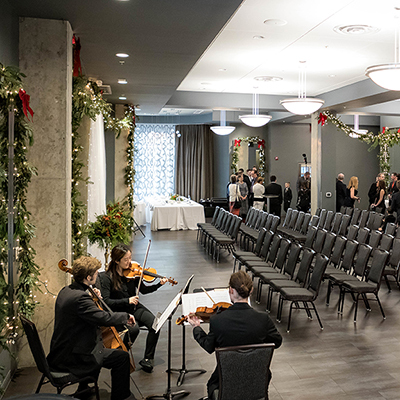 We have a built-in professional audio system that can be used to play music or address your guests with the microphones provided. You are welcome to create a playlist or we’ll put on our own music, based on the mood you’re looking for. 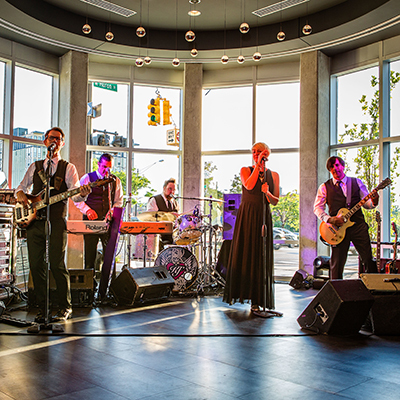 There is adequate electrical capacity and a separate sub panel available to allow a DJ or band to set up. We have a built in projector near the bar that is perfect for showing slide shows in the background during your event. Perfect for anniversary parties, weddings and some corporate events. For more interactive or detailed presentations we work with a local company who can provide flat screens that allows everyone in the group to view the presentation no matter where they are seated. We have the ability to show programs through Comcast for a nominal fee if you want to have the big game on while your guests are enjoying the event. We provide free wifi in the space for our guests. We have tested the capacity of the bandwidth many times and have found it adequate for large groups downloading large amounts of data. We carry a standard liability policy that covers damage to property or physical injury, as well as workers compensation insurance for all of our staff. If you have any specific requirements for insurance coverage for your event we can provide you with a copy of our coverage, and can also work with our insurance company to accommodate your needs. 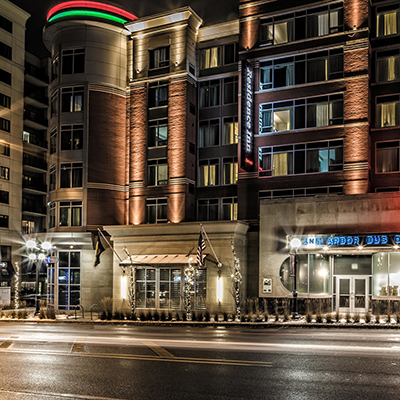 The Marriott Residence Inn is operated separately from the event space, however their sales office is happy to help you with hotel room reservations. Please know that the Marriott Residence Inn does not book reservations more than 50 weeks in advance. 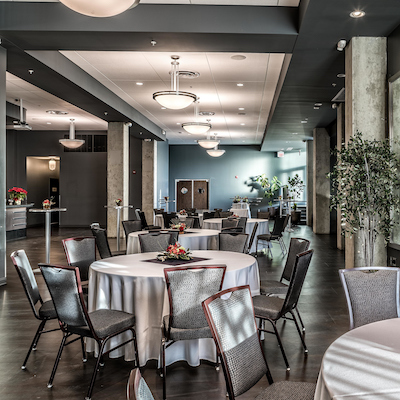 If you are planning an event farther ahead they will hold your information and assist you with the planning but the final room rental rates and booking information cannot be completed. We’re more than happy to set up a time for you to come in and view the space. Call 734-230-2300 or email greyline@zingermans.com if you’d like to stop by. You can also check out our sample floor plan. We hold the space for specific dates on a first come, first serve basis. As soon as you get in touch with us, we add your name to that event date and time in our calendar. If someone else gets in touch about that date before you’ve made your decision, we will be contact you to give you the opportunity to make a guaranteed reservation at that time. If you don’t move forward, we will offer that date to the next interested party. 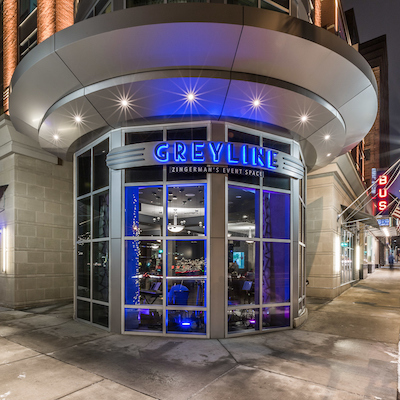 To reserve the Greyline for your event we require a deposit of $1,000 or the facility fee for your event (the greater of the two).